We expected this news three weeks ago – but with a pause until the Houston ALMS event, round 2 on May 12, perhaps there wasn’t a rush at Audi AG to confirm… that Allan McNish and Dindo Capello will compete in all the remaining ALMS events. From fifth round at Salt Lake City on 15 July, two Audi R10 TDI prototypes will compete in “the world’s most important sportscar racing series” – the Sebring winners to be joined by Frank Biela / Emanuele Pirro. Dindo Capello and Allan McNish will share an R8, with 35 kilograms of extra ballast, at Houston (12/05), at Mid-Ohio (21/05) and at Lime Rock (01/07) – while the R10s are prepared for, and racing at, Le Mans. 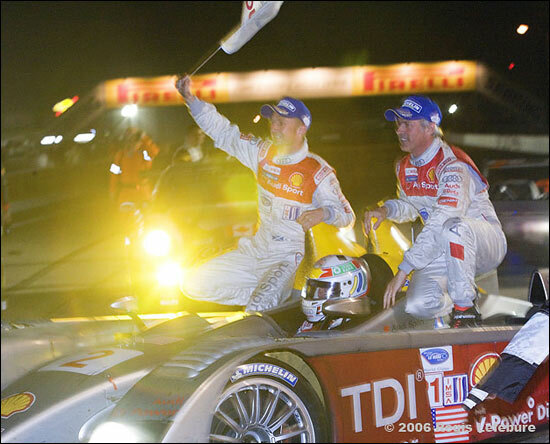 Marco Werner, who won the title in 2003 and 2004, will not compete in the American Le Mans Series “for the time being”. He will race at Le Mans, with Frank Biela and Emanuele Pirro, and is heavily involved in the Audi R10 TDI development programme. "Furthermore, Marco is first choice if we should compete in any additional races with the R10 TDI,” stresses Dr Ullrich. The 2006 season for the new (and old) Audi prototypes has parallels with 2000, when the 1999 R8Rs filled in at Silverstone's May ALMS event - an absolute classic, on a Saturday evening. Houston on Friday evening next month won't be quite the same!